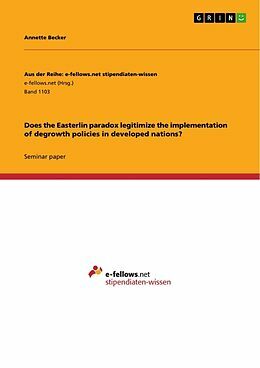 Does the Easterlin paradox legitimize the implementation of degrowth policies in developed nations? Seminar paper from the year 2014 in the subject Business economics - Miscellaneous, grade: 2,0, University of Bayreuth (Institut für Philosophie), course: Integration of philosophy and economics, language: English, abstract: "Every day, in every industrialized country of the world, journalists and politicians give out a conscious and unconscious message. It is that better economic performance means more happiness for a nation. This idea is rarely questioned. We feel we would be more cheery if our boss raised our pay, and assume that countries must be roughly the same. The results in this paper suggest that, in a developed nation, economic progress buys only a small amount of extra happiness." (Oswald 1997, p. 1827) Based on Oswald&apos;s introductory statement, this paper is going further than refuting the assumption that a certain kind of utility is solely contingent on absolute earnings. With the interpretation of utility as happiness, it would mean for the aggregate economy as well as for the individual that income secures happiness with a rising tendency. Having started with Oswald, another economist with well-known findings has to be made mention of: Richard Easterlin, who constructed the hypothesis that from a certain threshold of developmental achievements on, economic growth is of minor significance to the overall life satisfaction of a nation. The so-called Easterlin paradox originally arose as data on richer citizens within a country displayed a higher level of subjective well-being and led to the assumption that "economic growth improve[s] the human lot" (Easterlin 1974). Nevertheless, a comparison amongst well-developed states and over time revealed that there&apos;s little difference of each population with regard to happiness. Thus, it appears that not the absolute but relative wealth is of import to life satisfaction in crossindividual and cross-stratum comparisons. Even though it never gained as much attention as its foreshadowing counterpart by Easterlin, the phenomenon is also denoted as the "relative deprivation theory" (Oswald 1999, p. 360), pointing out the state of deprived happiness poorer individuals in a society suffer. 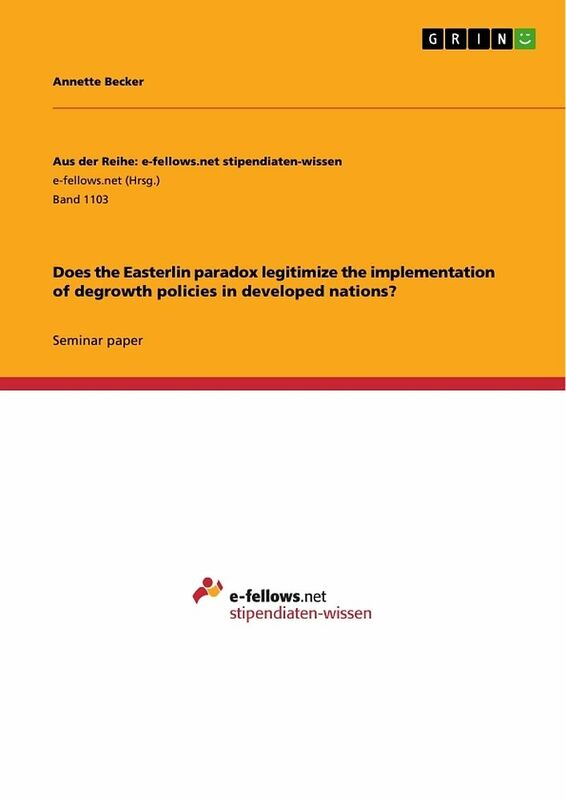 Titre: Does the Easterlin paradox legitimize the implementation of degrowth policies in developed nations?